Full name CHIH-WEI HU...His favorite pitcher growing up was Félix Hernández...Pitched for Chinese Taipei at the 2014 Asian Games in Incheon, South Korea (team won Silver medal). Enjoyed five stints at the Major League level with Tampa Bay, posting a 4.15 relief ERA, limiting Major League hitters to a .149 average against (7-for-47)...Longest stint pre-September was five days at the beginning of May...On July 12 at Minnesota was the only reliever used by the Rays in a 5-1 loss...Went a career-long 5 IP and both hits allowed came in the 7th inning...Made 24 appearances (19 starts) for Triple-A Durham in the regular season...Started the Triple-A National Championship Game against Memphis, yielding two runs in 1 IP and taking the loss...Right-handed Triple-A batters hit .215 (42-for-195) off him. 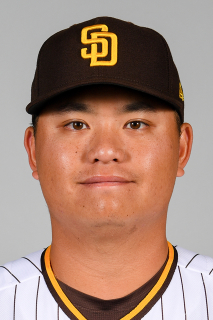 Made 6 apps over six stints with the Rays, his first career major league action: April 23-May 2, May 4, May 30, June 10 (G2), Aug 24-27 and Sep 21 through the end of the season... Made his major league debut on April 24 at BAL…became the first Taiwan-born player in Rays history and the 12th in major league history, according to Baseball Reference.... On June 10 vs. OAK (G2), took his first career loss, replacing the injured Matt Andriese…his only run allowed was a solo homer to Josh Phegley, and his 4 IP and 5 SO both matched season highs for any Rays reliever in 2017... On Sep 28 at NYY, allowed a solo homer to Greg Bird, his first batter faced in the 4th inning, but recorded his first career win after the Rays 7-run 5th inning... Went 4-1 with a 3.06 ERA (61.2-IP, 21-ER) in 31 regular season apps (4 starts) with Triple-A Durham…was used exclusively out of the bullpen from May through the end of the season, aside from a spot start on Sep 2 at Gwinnett (G2)…went 3-1 with a 2.89 ERA (43.2-IP, 14-ER) in 27 apps as a reliever... Made a pair of scoreless apps in the IL postseason…allowed a run in his inning of work in the Triple-A National Championship Game against Memphis (Cardinals), a 5-3 Bulls win... Ranked by Baseball America as the No. 27 prospect in the Rays system following the season… the publication also tabbed him as having the Best Changeup in the organization for a second consecutive year. Made 24 starts with Montgomery, where he spent the entire season aside from an April spot start with Triple-A Durham…totaled a career-high 25 starts, 147.1 IP and 114 SO...His 2.75 ERA (147.1-IP, 45-ER) between the two levels ranked 4th among Rays minor leaguers...Led the SL with a 2.59 ERA, ranked 3rd with a 1.15 WHIP, 5th with a .241 opp avg. and 8th with 107 SO...Named to the SL midseason and postseason All-Star teams...Yielded 1 run or fewer in each of his first 6 starts for Montgomery…had an 0.54 ERA (33.1- IP, 2-ER) through that stretch and entered the All-Star break with a 2.01 ERA (67-IP, 15-ER) through 12 starts...Allowed 4 ER in 4.2 IP in his only Triple-A start, April 23 (G2) at Norfolk (Orioles)...Pitched for the World team in the Futures Game in July at Petco Park…had a perfect 5th inning with strikeouts of Ryon Healy (Athletics) and Dominic Smith (Mets)...Ranked by Baseball America as the No. 5 prospect in the Rays organization following the season…also tabbed by the publication as having the Best Changeup in the system. March 15, 2019 Cleveland Indians optioned RHP Chih-Wei Hu to Columbus Clippers. November 19, 2018 Tampa Bay Rays traded RHP Chih-Wei Hu to Cleveland Indians for 2B Gionti Turner. September 20, 2018 Tampa Bay Rays recalled RHP Chih-Wei Hu from Durham Bulls. July 25, 2018 Tampa Bay Rays optioned RHP Chih-Wei Hu to Durham Bulls. July 23, 2018 Tampa Bay Rays recalled Chih-Wei Hu from Durham Bulls. July 15, 2018 Tampa Bay Rays optioned RHP Chih-Wei Hu to Durham Bulls. July 12, 2018 Tampa Bay Rays recalled Chih-Wei Hu from Durham Bulls. May 5, 2018 Tampa Bay Rays optioned RHP Chih-Wei Hu to Durham Bulls. April 29, 2018 Tampa Bay Rays recalled Chih-Wei Hu from Durham Bulls. April 17, 2018 Tampa Bay Rays optioned RHP Chih-Wei Hu to Durham Bulls. April 16, 2018 Tampa Bay Rays recalled Chih-Wei Hu from Durham Bulls. March 16, 2018 Tampa Bay Rays optioned RHP Chih-Wei Hu to Durham Bulls. September 21, 2017 Tampa Bay Rays recalled Chih-Wei Hu from Durham Bulls. August 28, 2017 Tampa Bay Rays optioned RHP Chih-Wei Hu to Durham Bulls. August 24, 2017 Tampa Bay Rays recalled Chih-Wei Hu from Durham Bulls. June 11, 2017 Tampa Bay Rays optioned RHP Chih-Wei Hu to Durham Bulls. June 10, 2017 Tampa Bay Rays recalled Chih-Wei Hu from Durham Bulls. May 31, 2017 Tampa Bay Rays optioned RHP Chih-Wei Hu to Durham Bulls. May 30, 2017 Tampa Bay Rays recalled Chih-Wei Hu from Durham Bulls. May 5, 2017 Tampa Bay Rays optioned RHP Chih-Wei Hu to Durham Bulls. May 4, 2017 Tampa Bay Rays recalled Chih-Wei Hu from Durham Bulls. May 3, 2017 Tampa Bay Rays optioned RHP Chih-Wei Hu to Durham Bulls. April 23, 2017 Tampa Bay Rays recalled Chih-Wei Hu from Durham Bulls. March 15, 2017 Tampa Bay Rays optioned RHP Chih-Wei Hu to Durham Bulls. November 18, 2016 Tampa Bay Rays selected the contract of Chih-Wei Hu from Montgomery Biscuits. April 24, 2016 RHP Chih-Wei Hu assigned to Montgomery Biscuits from Durham Bulls. April 22, 2016 RHP Chih-Wei Hu assigned to Durham Bulls from Montgomery Biscuits. April 5, 2016 RHP Chih-Wei Hu assigned to Montgomery Biscuits from Charlotte Stone Crabs. August 14, 2015 Charlotte Stone Crabs activated RHP Chih-Wei Hu from the 7-day disabled list. August 11, 2015 Charlotte Stone Crabs placed RHP Chih-Wei Hu on the 7-day disabled list. August 1, 2015 RHP Chih-Wei Hu assigned to Charlotte Stone Crabs. July 31, 2015 Tampa Bay Rays traded RHP Kevin Jepsen to Minnesota Twins for RHP Chih-Wei Hu and RHP Alexis Tapia. May 20, 2015 RHP Chih-Wei Hu assigned to Fort Myers Miracle from Rochester Red Wings. May 18, 2015 RHP Chih-Wei Hu assigned to Rochester Red Wings from Fort Myers Miracle. April 7, 2015 RHP Chih-Wei Hu assigned to Fort Myers Miracle from Cedar Rapids Kernels. July 7, 2014 RHP Chih-Wei Hu assigned to Cedar Rapids Kernels from Elizabethton Twins. June 19, 2014 RHP Chih-Wei Hu assigned to Elizabethton Twins from GCL Twins. February 10, 2013 RHP Chih-Wei Hu assigned to GCL Twins. August 3, 2012 Minnesota Twins signed free agent Chih-Wei Hu.